It's called "reading," and most people aren't doing it while stocking up at the grocery store. During the past 100 or so years, food has evolved immensely! With an extremely large spike in the overall world population (now estimated at over 7 billion people), more food is needed to feed the masses, but with this comes a host of downsides regarding food quality. Nowadays, millions of people aren't eating "real food" anymore; rather, most are consuming "food like products," - falsely flavored, deceptively colored, chemically saturated items that are engineered to taste and look a certain way. If you can't read it, don't eat it! This is a universal rule that all people should implement whenever shopping for food, and the best part is that it only takes about five seconds to complete. • Pick up an item at the store. • Turn that product around. • Read the ingredient list. • Place that product into a category. 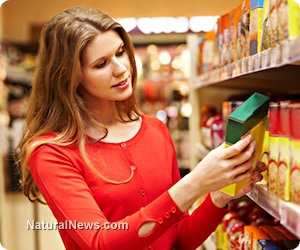 If it's hard to understand what's printed on the ingredient label, don't buy it. If you see it as "real food," consider it a healthy purchase. If the ingredient label looks like some type of chemical list for a science experiment, it wouldn't be a good choice. The key here is to keep selections of real quality (actual food) - words that are easy to understand, e.g., organic chicken, water, organic celery, Himalayan salt, grass-fed butter, coconut oil and organic almonds. It's easy to see that these types of ingredients are easy to recognize and are equally great for maintaining an optimal level of health. By implementing this trick, consumers can begin to filter out junk that the body has a hard time processing. From additives like MSG to damaging chemical food colorings, one will find that keeping their selections of pure quality can ultimately lead to optimum health if they start reading their ingredient labels rather than "counting their calories." It truly is that easy. With that said, the problem still points to the consumers. If the demand remains high, production will continue - the change begins with what's in demand. The human body prefers what it is able to recognize, and in this case, that would refer to real, wholesome organic food. When processed and preserved items are thrown into the mix, the body, in a sense, has a hard time dealing with such an influx. Disease rates are sky high, people are dying of very preventable conditions, obesity is more common today than 100 years ago, and much of it has to do with food choices. It all ties back to the selections that people are making, and if this problem is to be tackled and dealt with accordingly, we all must change the ways in which we buy and eat our meals. By keeping food choices clean and natural, society, as a whole, can begin to reap the benefits of leading a pure and very natural lifestyle. Remember, there is no magic pill for health, but there are smarter decisions. Joey Cardillo has been heavily involved in the online health community for over three years. When his company Versatile Health LLC (http://www.versatilehealth.com) was launched in 2010, he began his journey into the online world of health blogging. Since then, he has published #1 best selling books on Amazon, and has been able to help people from all over the world gain better health with simple lifestyle reformations. Joey studied journalism in college and received his BA in Mass Communications in 2010. A year later in 2011, he decided to become a certified FDN (Functional Diagnostic Nutritionist). His FDN training allows him to correct common ailments with his clients by utilizing natural protocols.